New Owners, after the excitement wears off from owning a Polaris Slingshot, take a look at the rear Tire Rim, as shown in the video. You are going to see some caked up dirt that is glued in place it will seem. This is a condition that will happen to all owners unless you take actions I have outlined to prevent it. The first cleaning operation you preform on your new Slingshot will be fun spraying the wax mist on the finish and wiping it to a sparkling shine. then you get to the wheels. You find it is a big chore to clean that rear wheel Rim. My video will show you how to overcome this burdon and make it much easier and keep those Rims in nice shiny look. Dirty wheels just take away from the overall great look! You will need a new Cleaning Tool and a box of Refills, the 360 models. It will store nicely in the Drivers Storage area. Use it after each ride, or just show off at the ride meet with a quick dusting. Keep them clean and they will be easy peasy to keep that way. While we are on the subject of Tires, let's tell you how long to expect to safely ride on them. I had a 2015 SL model and put a little over 19,000 miles on it before trading. At just a little over 17,000 miles I fund I was down to the deep wear bars in the tread. Now that is what you can expect if you do not do Tire Burnouts and pealing off from redlights. I do drive fast in the mountains around the curves, so I do put extra wear that a person that does not drive in the mountains. The Fronts will get twice the miles so you will just have to replace 1 rear and then next time 3. Now if you are close to your mark for changing your rear tire, that would be a good time to try a Tire Burnout in a very safe location. Pushing the ESP switch on the dash will take traction control off and you can really burn it off the rim!. Just remember, you still have to get to the tire store. That is another thing, when you need a tire, most custom wheel places do tires and will take care of you with no damage to your rims and they sell tires that will fit your Slingshot Rims. You will get a a good deal if you shop around. I changed the Kenda rear tire at 16,000 miles and it was not down to the wear bars. SSITS was coming up and I wanted the max traction in the wet so I changed it out. The fronts I changed at 21,000 mile and they were not down to the wear bars either. My tire was the Stock Slingshot Brand Tire. That is another part of the equation for miles you can get, they brand and quality of tire. FunCycle has brought up a good point, the type and conditions you drive in will be important as to how far down you go with your tire wear. I know FunCycle likes his performance drives, so he wants good rubber on the ground for his many different driving ranges. The more your tire wears the less safety you have for wet road conditions and hydroplaning becomes a bigger factor and the tread groves are not as deep and can not pump out as much water as you hit water puddles. The more aggressive you drive the less wear you will want to place on the tires before you change them out. Keep a look at the wear bars and find the point you are comfortable with. For the folks that have no experience with Tire Wear Bars, here is my Slingshot Tire with over 8000 miles. As can be seen, the first wear Bars are smooth with tread. I still have a ways to go for the Second Wear Bars. This will help you know when you have gotten all the safe miles out of the tire. When the Second Bar is reached, you need to be shopping for a tire! Try to do it before the second bar is smooth with the tread for your best safety and tire wear economy. 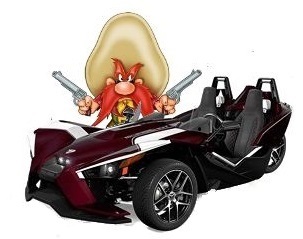 As you drive your new Slingshot out of the dealership and begin your adventure into the new world of "Slinging". Yes that is the term we use a lot for going for a ride. The dealership only puts in a gal or so of gas to do test rides and such. You will need to go to a Gas Station and get your first fill up. Here is the important thing you need to to know ahead of time. The front spoiler is only 5" clearance with the ground. If the gas station has a strong dip for the entrance, avoid those type stations or learn to approach the entrance at an angle of 45 degrees. The reason is if you hit the incline straight on and the incline is steep, you will scrub the bottom of your spoiler. This can do two things, destroy the alignment of the spoiler for one thing and mess up the bottom of spoiler or bend the support bar for spoiler. So always analyse entrances to restaurants, gas stations, and every where you need to enter off the main road. If you have LED systems mounted under the spoiler they can get damaged. Here is one more thing to avoid because of the low clearance of the front spoiler, parking stops at business locations. Also curbs that you have to park against. Take the time to view how close you can drive up and not hit the curb. Front LED lights will be destroyed. This is something you need to learn real quick before you cause damage. One other very important thing for the new owners to consider. Parking parallel to a curb. The stock rims stick out a little past the sidewalls of your tires, if you hit the curb, your rims will receive guaranteed damage. Avoid parking in these locations if at all possible. If you have to do it, have someone to help guide you to avoid hitting the curb. You will be sick at how it will mess up those beautiful rims. If you have custom rims. don't even think of parking parallel without a spotter. It is very hard to judge how close you are. Good Luck and enjoy that new Slingshot! Here is a video I produced to help if you need to park parallel to a curb. Angle parking may be an option. Practice it with someones help. New owners, this is something you will wonder about and will not know the answer for sure. What to expect when it rains. I have experience with this subject as I first owned my first Slingshot in 2015. I had not had it long and it was Feb 13th that we picked it up. Around March I think, Gail and I had gone for a test ride to test our new Air Hose ducts we installed from the Fender area to the wheel well. We went from Gainesville, Fl down to Ocala area, had lunch and on our return trip we saw the clouds turning black. As we approach our Payne's Prairie area of South Gainesville, the bottom fell out. At the time I was traveling about 65 mph, close to the speed limit. The rain drops were big and my face was being pelted with painful hits, I began to slow, still the rain hit hard, my glasses started to fog, I had a hard time seeing. I slowed more, maybe to 45. At this point I was wiping my glasses trying to see the road. I have a shield that is part of my Scorpion Helmet that I deployed. After a short time that began to fog, I wiped constantly to try and see with a lot of difficulty. I found I had to pull over. At this point, it was very difficult to see the road and anything else. I will never drive in a heavy downpour again. There is too much water hitting you and your face. Be safe, when you see that there is a very heavy rain coming ahead. Just pull over and put your rain suit on, Gail has an umbrella stored by her that she can pull out and keep us out of the heavy rain while we wait it out. Folks, I have ridden motorcycles in heavy rains a lot and was able to duck down behind the windshield and keep my face clear somewhat. I found with my Slingshot I had no option like that. As you will see in my diagram, the windshield is low, the seating position is way back from it. I am giving new owners my advice from experience, don't try to drive in heavy rain. Plus the dangers of hydroplaning are big with puddles that can form in the road. 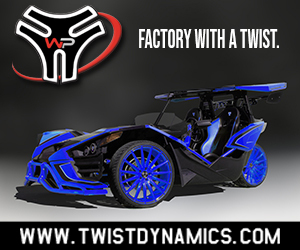 The slingshot with 3 wheel relies on ESP Stabilization program to help maintain the Slingshot in a safe driving condition. The program does not work if you hydroplane. This advice is when there is a heavy rain, very light rain is ok to drive in, you will just get wet. I plan on a video when the rain conditions are just right to show the effect. You will have to find out from the Topper guys how a top works under these conditions. As mentioned above, Gail has an umbrella that works great when we are stopped. Here is Gail's Afordable, Portable, Convertable Top! Perfect for those times of Traffic Delays or Rain! After you get a little driving time with your passenger, show you passenger this is Top! New Owners, now that you have gotten some of the most important information from this thread, I want to give some information about the Audio System that comes with the SL and some other models. The Base Model does not come equipped with the Audio System, so this will not apply. First off, the Fm and Am Radio feature does not pull in station except when very powerful signal from transmitting tower. Your best options for music will be from Spotify, Pandora, and other services online. You have the feature to Bluetooth your Smart Phone to the Audio System. There is one other way you can have music of your choice on a Memory Jump Drive. Located in the Glove Box is a USB port that has access from the Audio System. This is my favorite way to listen to my music I like to drive with. If you drive in the mountains as I do, you will find the online services will not work that well all the time. The USB Port with selected music loaded on a Memory Jump Drive will play anywhere and you will love it. No linking to internet, just access the port using the Mode switch on the Audio System. To find out all the features of the Audio system and how they work, I suggest you pull up the 2017 or 2015 Owners Manual I have linked at the beginning of this thread. All my information is based on the 2017 Owners Manual. The Audio System starts on Page 123 for that issue. I have a few video that may help, they were made when I had my 2015 SL Slingshot. It should work for other years, check your manual for any variations I am unaware of. 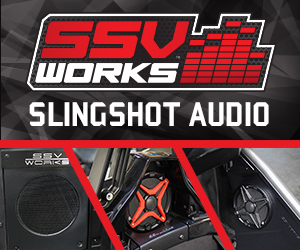 Driving the Slingshot with your favorite music will give you a great feeling. Thanks @Ross, great suggestion, I will work on that! One big important thing for new Owners is to keep up with any Slingshot Recalls that may be active. I will give information that will make it easy for you to do that check for your Slingshot. First I will give the Main Polaris Slingshot Website. I will also give give you a link to the Resources Page, this will lead you to the Owners Resources Page. There is also a lot of other useful information under a lot of buttons. I suggest you take a look. I have also given you a direct Link to the Products Safety Recalls Page for quick access, but if you go to the Owners Resource page there will be a banner indicating what recall is active for immediate action. Your Vin number is located on the Driver side frame Bar. While there take a look at all the other important information about your Slingshot. Your Dealer should be able to help you with any Safety Recalls, check with them if you have questions, this check should give you a heads up of what is applied to your Slingshot. I checked my Vin and the latest Recall did not apply to my Slingshot, it was just an inspection to check if it needed to replace the Seat Brackets, after the inspection they said mine were fine. Edited once, last by samowens44 ( Oct 3rd 2018 ). All recalls do not affect all Slingshot, the Vin of your Slingshot will let you know what recalls have impact on your Slingshot. So that is why you want to enter your Vin into the Product Safety Recalls Link page of Polaris Slingshot. Here is the latest Recall that I have seen and let you see the details of the Recall. Our Forum has Threads that will discuss Recalls just search for them and keep up with what effects you. This is a Recall on Seat Belts for 2017-2018 If you you are not good with the internet and just want to know, does it affect me, call your dealer, they can let you know and schedule a time to get it looked out. To view the details of the Recall on Seat Belt Features click on the Plus Sign and it will open up, you will see what year and Slingshot Models affected. Mine is a SL LE and it is not listed and also when I checked my vin, I was unaffected. Edited 3 times, last by samowens44 ( Oct 3rd 2018 ). New Owners, you need to assemble a small amount of tools and materials for those unexpected times that things fail to work the way they were intended. You do not need a big tool bag. Here is going to be the most useful small tool kit you will need. It has up to T35 Tox bit, T40 are the screw size for battery compartment and other covers that require a T40. I found the T-35 bit will do the job. It has a 1/4 socket drive bit that will allow you to have a set of 1/4 sockets if you like. You could have a small pair of reg pliers, a small adjustable wrench. A pair of needle nose with side cutter and a 12 volt test light, LED style at auto stores. A small volt/ohm meter is handy. A number of small and longer zip ties along with Wire Splice connector, the little blue things with the little metal blade for connecting wires. A small roll of Back Tape. This is about all you will need. You many not ever need it, a friend or some other person on the road you may be able to help. If nothing else, drop the hit, you want the Wadsworth Tool Kit and give them the order info. for Christmas. Yes, I have one of these Tool Kits and it has been the best tool kit I own. Bought in Sturgis Rally in 2000 at the event for $60. At the time I thought that was a big price, it is worth it to me and even the new price. Thanks @Ross for suggestion,I will work on developing helpful info for our members. I will create a thread to help each of the key functions. Ross, I agree, the info here will be hard to find points of interest for anyone. I will create an index at the beginning of this thread that will have links to each of the subjects. As I add new information subjects, I will update the index with a link for the new subject. Folks will be able to go to the subject that will help quickly. @Ross you and all our administrators are clearing doing their job to monitor and find ways to improve our services. I had not thought in these areas. There was an accident in Houston where the Slingshot was upside down. The suspect failure may have been from a neglected Recall. The owner was suposed to know of a Brake Pin Recall for his Slingshot and elected not to get it looked at. No other details, here is an article about the recall and a diagram of the affected parts that are in question. Let's all promptly respond to any recall on our Slingshots. Don't figure you will skip it, it may be very important. Photos and Details of the Accident.